Rabbi Sally - For People, For Pets, For Coffee! Rabbi Sally is available for weddings, counseling, funerals/celebrations of life, and teaching. Pet Naming Services for your new family member and Pet Memorial Services for those who've departed. Join Rabbi Sally and others for coffee and conversation twice monthly at Hyatt Palm Springs. 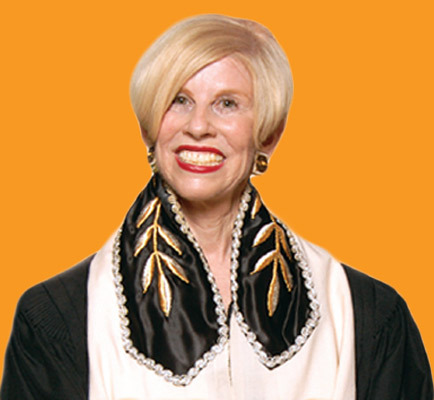 Known as ‘Rabbi Sally’ around the greater Palm Springs area, her community outreach includes ministering to the LGBT community, feeding the homeless, actively supporting local charities, visiting the sick, and personal counseling. She brings true joy to all those she meets. TDS: "Pet memorial services flourish in Palm Springs"
Zach was a devout Jewish golden retriever who understood Hebrew, loved Shabbat and Hagim and had an addiction for challah. “He knew when it was Shabbat. He would see me getting ready and sit down and his tail would start wagging. What he wanted was the challah,” said Ron Werner, one of Zach’s parents. His full name was Zachariah Obediah Werner-Hering and he also loved to swim in the family pool, chase balls, go hiking and give his parents unconditional love.